The designers created, the men walked, and now, I somehow managed to choose my three favorite Fall/Winter 2013 Menswear looks. My top picks for menswear this season were Louis Vuitton Look 36, Salvatore Ferragamo Look 20, and Dolce & Gabbana Look 7. This Louis Vuitton look caught my eye because of its beautiful deep crimson color and eye popping feral and floral embroidery. The shawl lapel was a smart choice because it’s unique, and makes the jacket more casual. The jacket was one of my favorites out of the collection, because it’s such a versatile look that you will not find on the runway often. Salvatore Ferragamo’s look topped my list as well, mainly because of the color.The indigo mesmerized me, matched with the blue-greyish shirt and tie made the perfect pair for this jacket. The key thing that makes this look great, in my opinion, is the subtle tying of the belt instead of buckling it. I love the undone, yet polished, look. 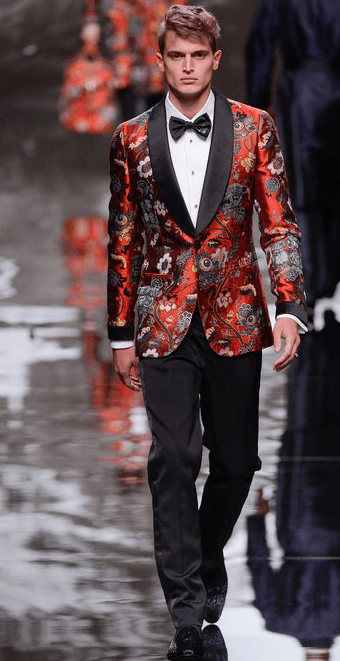 The best look of this current menswear season had to be the Dolce & Gabbana lace blazer. Just when I thought the brand could not top themselves and get any more Italian, they found a way. The lace blazer was my favorite look because of its unique, classy, and edgy look. If I could sell every blazer I owned (which is a lot) for this one, I would do it in a heartbeat. This jacket is the perfect item to have for a big family wedding or just a dinner with the other mobsters. The designers floored me with this current season, and I am already counting down the days until next season.